*Edited to add* I got a text message from Pam Jackson asking me to put the word out. Can you do me a favor and send a shout out via blog that my mom needs good energy and well wishes. Been at her place since Friday. She had surgery on Friday, did amazing but around 4 am yesterday she was having issues, taken to ICU. Couple hours ago she was put on a ventilator. Bp and oxygen was dropping. If you know Pam or know anyone that may know her but doesn't follow my blog, pass the word on and send a prayer or two her way. I did it. I posted EVERY single day this year. I may not have had a whole lot to say on some days but there are 365 posts for 2018. I suppose this is the post where I reflect back on the year and count my many blessings. It's true, I do feel blessed. Not only to be where I am right now but to have so many amazing people there with me. As much as I have tried, I can't come up with the words to truly express how I feel. 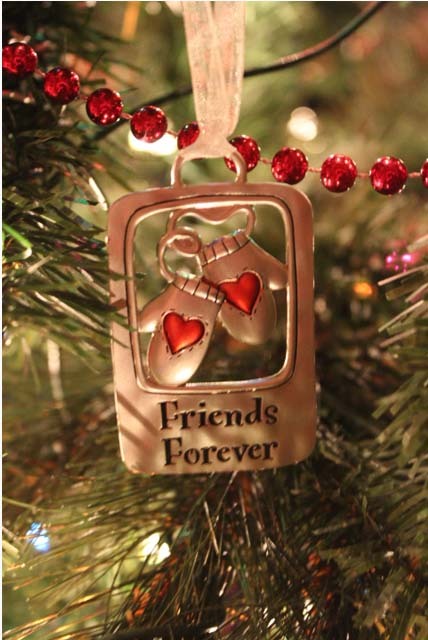 I think instead, I will simply tell all of you how much your friendship has meant to me this past year. Here's to another year of friendship. It was 54 on Friday and snowing on Saturday. I procrastinated Saturday morning about doing anything and in the end staying home and doing nothing won out. I did however manage to do my laundry and make a pot of ham and potato soup. 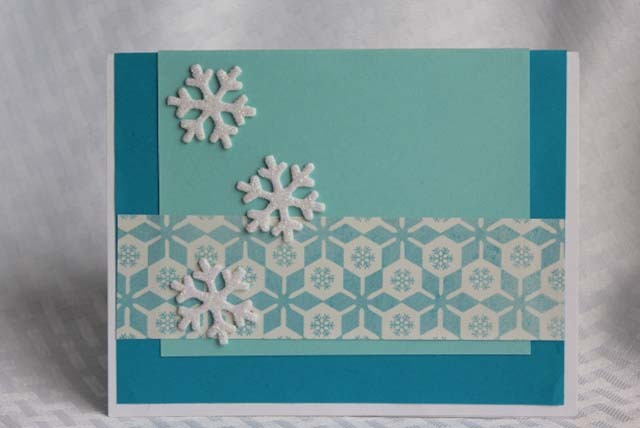 Since the ground is covered in snow this is a good time to show you a card that I made a few weeks ago. This one was a first attempt and didn't turn out as well as I liked. I ended up doing a second one that went out in the mail. The inside. 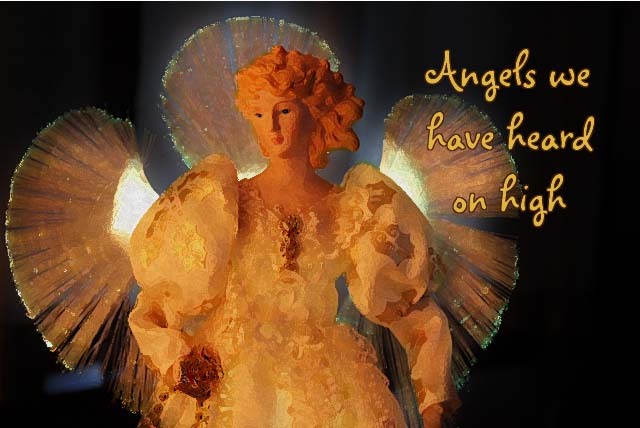 This was a pop up card and I was kind of winging it from various directions I had seen. 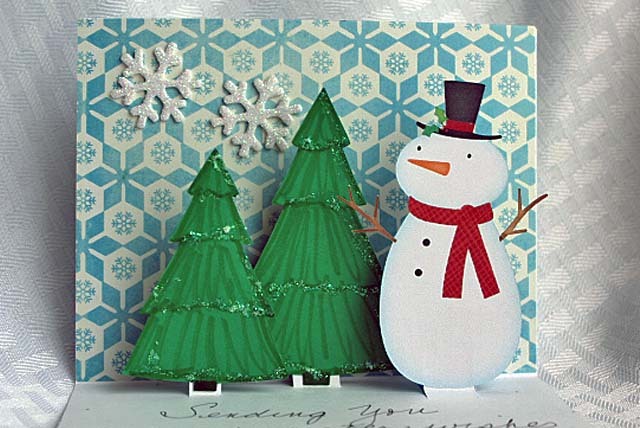 The trees and snowman were cut on my cricut. After I get done work today I am off until January 2nd. I was surprised that I got 2 days off in a row this week too. Yesterday was a gray, cloudy and kind of drippy day but when I walked out to my car after work I was amazed at how warm it was. My southern friends may want to put a sweater on before you read that temperature. You may recall I said I went to the doctor about a couple issues and for one she had sent me to get an x-ray. 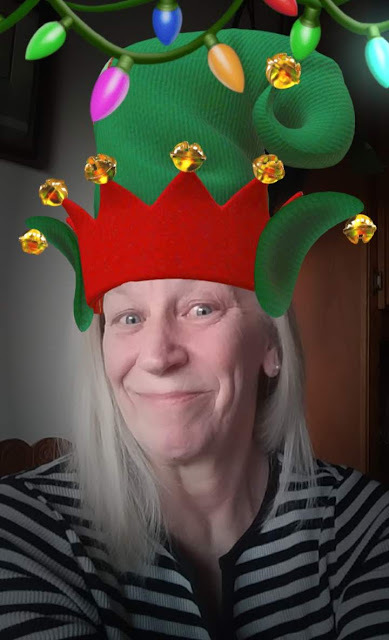 I called them back Monday (Christmas eve) and said that I couldn't quite tell if the swollen glands were still swollen or what I was feeling was more from the pain in my neck. She gave me 3 more days worth of antibiotic and said that if the glands aren't better by the first of the year, they'll do a sonagram. As for the neck issue, she said the x-ray showed quite a lot of arthritus so that would be the problem and not a pinched nerve. She changed my anti-inflamatory from Meloxicam to Celebrex. Hopefully that will help. On to something different, I've got a few things sitting out on my kitchen counter. This can sit out all winter since it's more winter than Christmas. 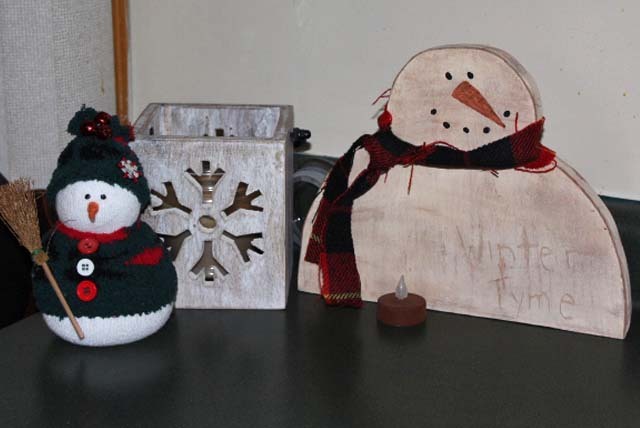 I made the sock snowman and the wood snowman. The snowflake box candle holder I bought a couple years ago. 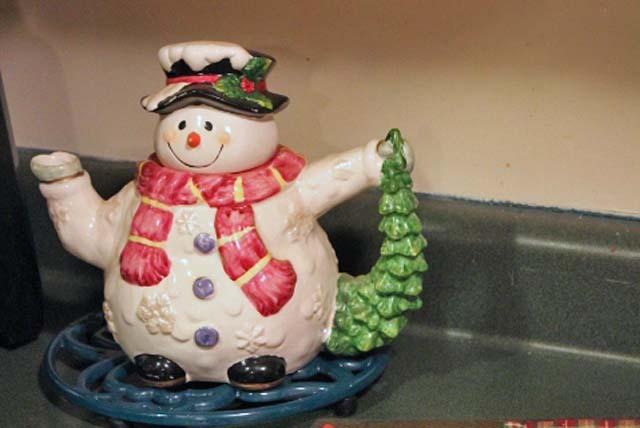 This snowman teapot has been around for quite a while. Usually it stays in the cabinet where I have a whole bunch of other snowmen. 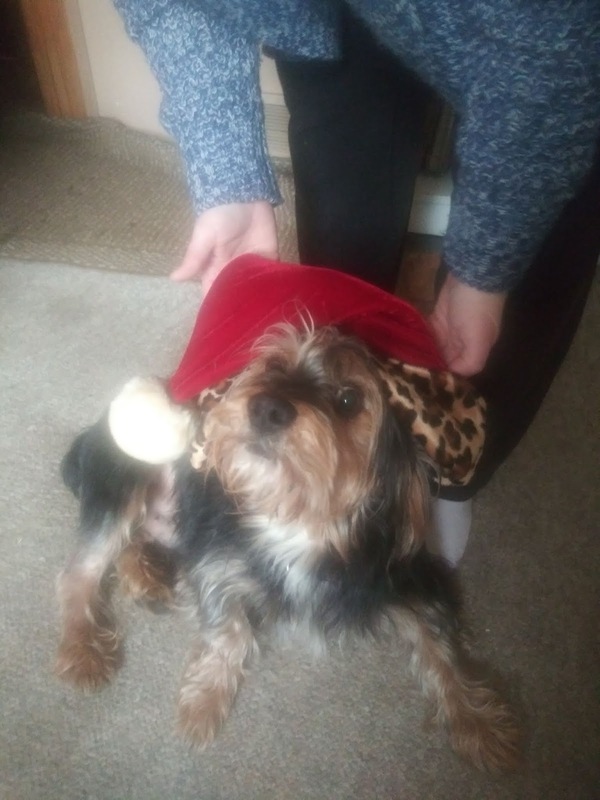 This year I thought he might like to come out and celebrate with me. I should have done this post yesterday and the comment Lin left on my post yesterday reminded me that I meant to but forgot. Any way, I survived another first. Christmas eve my daughter, her bofriend, my son, his fiance and Presley came over. It was a short night because my son and his family had to go to her father's house. 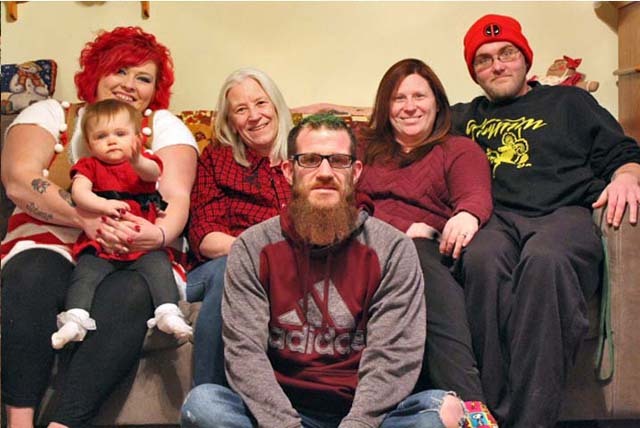 We managed to get a family shot before they left. Christmas day I went to Amanda's boyfriends family's house. They had breakfast in the morning and dinner in the evening. I was invited to both but said I would just be there for the breakfast. I spent a few hours there then came home and the rest of the day was lounging on the couch watching sappy Christmas movies. I hope everyone enjoyed their day yesterday, no matter how you chose to spend it. It's back to work today and business as usual. 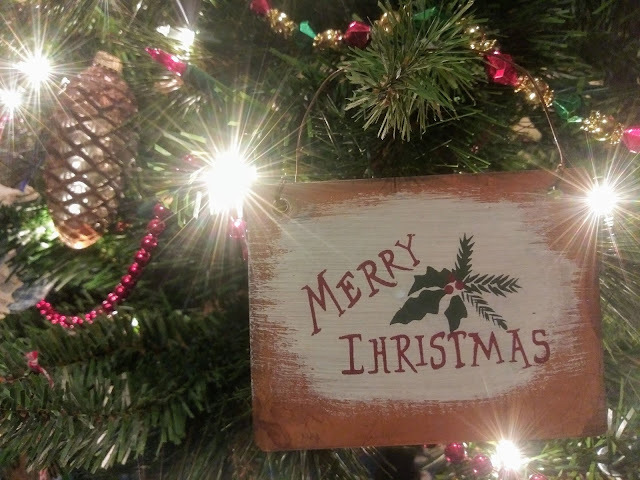 Of course here on the blog I may still write about Christmas for a few more days. Those of you who follow me on Facebook may have already seen this but I'm posting here any way. 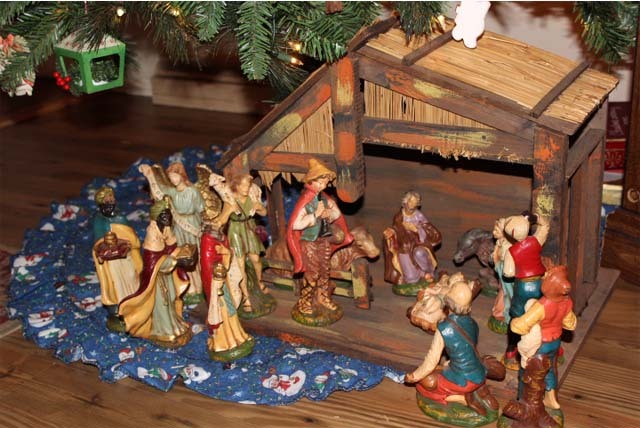 As long as I have been alive, my family had a nativity set that we put under the Christmas tree every year. I remember growing up how much I loved to arrange the pieces. Way back in the day, it included camels and sheep which melted and became disfigured during storage in our hot attic. Some pieces were slightly broken but still were a part of the yearly display. When my dad could no longer live on his own, he moved it with my brother. What didn't get sold or given away went to my brothers house. 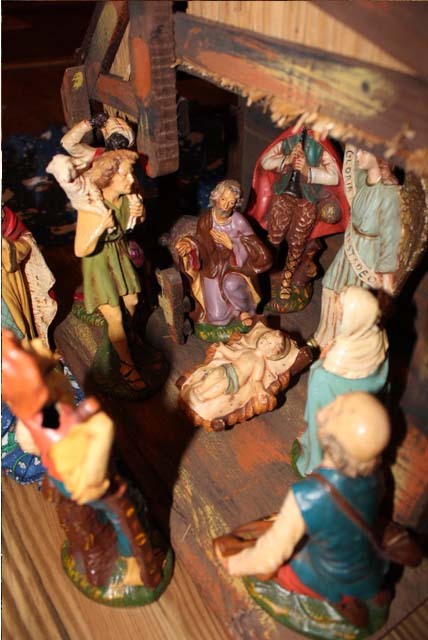 The nativity set was displayed every year at their house. 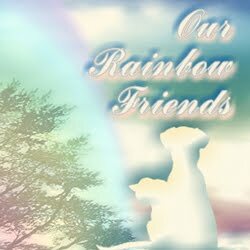 My brother passed away several years ago. 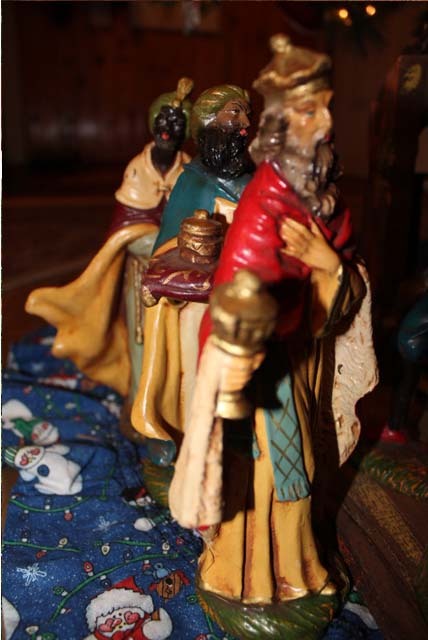 I was talking to my sister in law a month or so before Christmas and she said that she wanted to give the nativity set to me. Sunday evening my niece dropped it off. 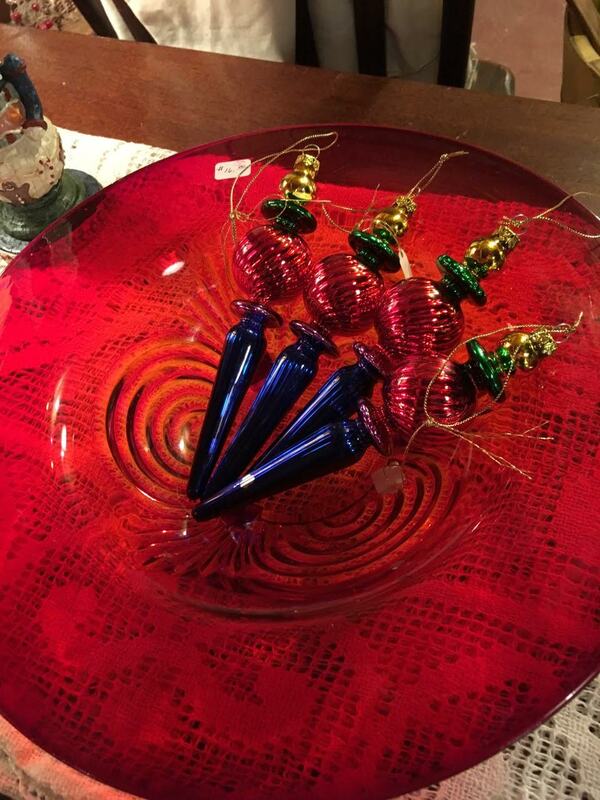 After she left I carefully unwrapped each piece and began to arrange them under the tree. As I opened the one shepherd I recalled how he had the hole in his one shoulder. 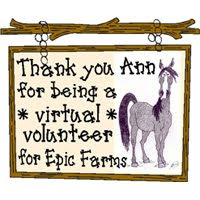 I remembered how years ago the donkey had one missing ear. Each piece came out of the tissue and brought tears as I remembered all those Christmases from long ago. 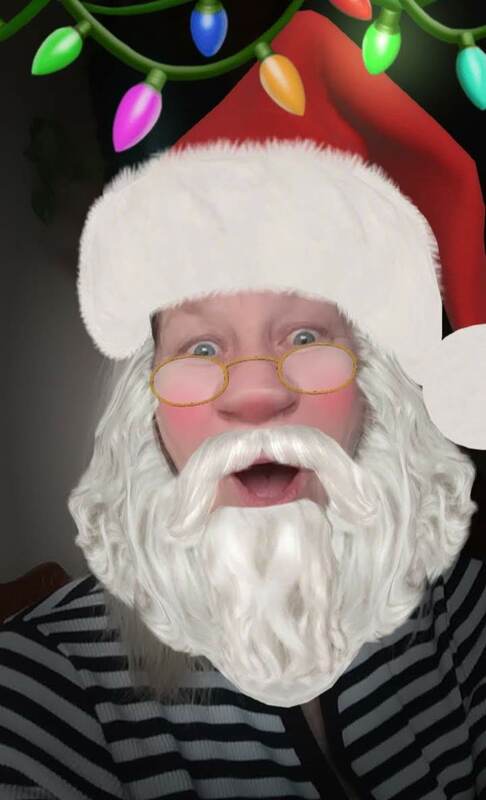 I played Santa for a lot of years but this is the first time I've really looked the part. 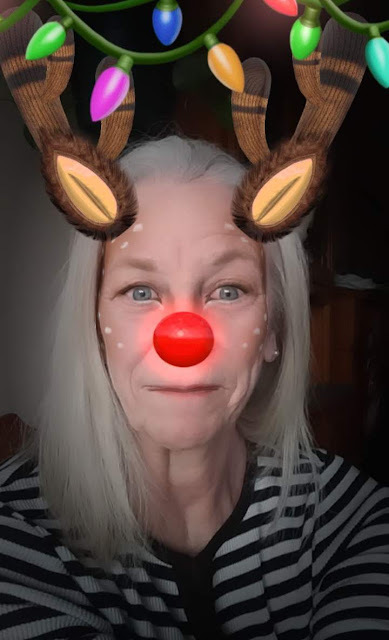 Oh deer, it looks like I might be pulling the sleigh tonight. Stop laughing and calling me names. I'll be back tomorrow with a couple more. 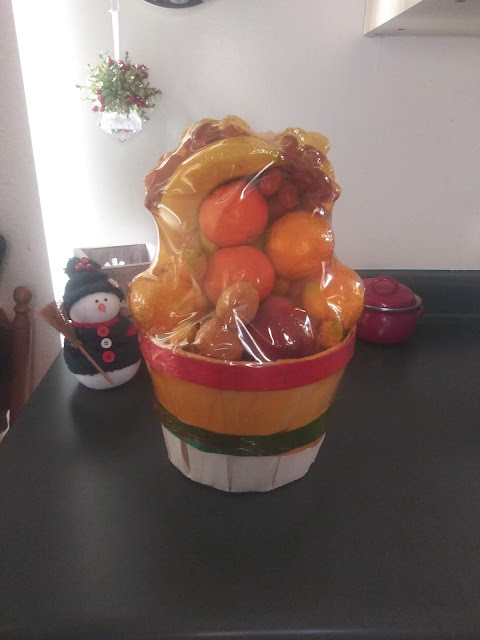 The other day at work the boss got a fruit basket from the bank. He didn't want it and the girl in the office didn't want it so they passed it on to me. Years ago, our produce department used to make a ton of fruit baskets for Christmas. There were always lots of orders for them plus they would make some to put out. Now we hardly make any of them. 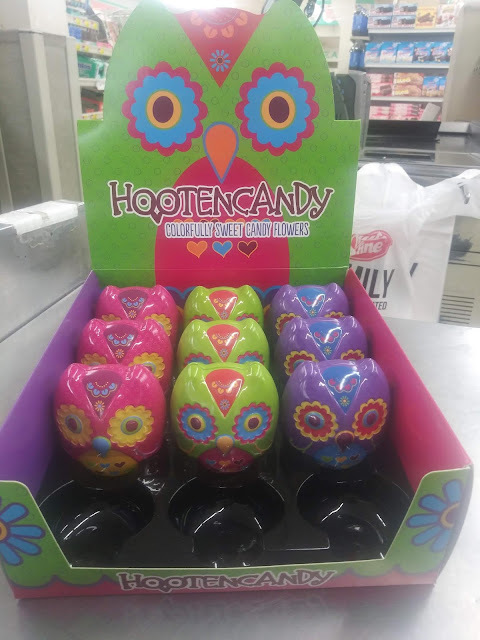 Do you give or get fruit baskets? I opened up a delicious piece of dove chocolate and this was inside the wrapper. 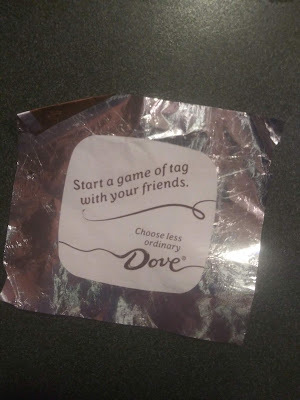 So lets play tag. I'll start and the first person to comment is "IT" Then you tag the next person to come along. I'll ask a question (Christmas related) for the first person to comment, that person answers it and then ask a question for the next person. Ok here we go. 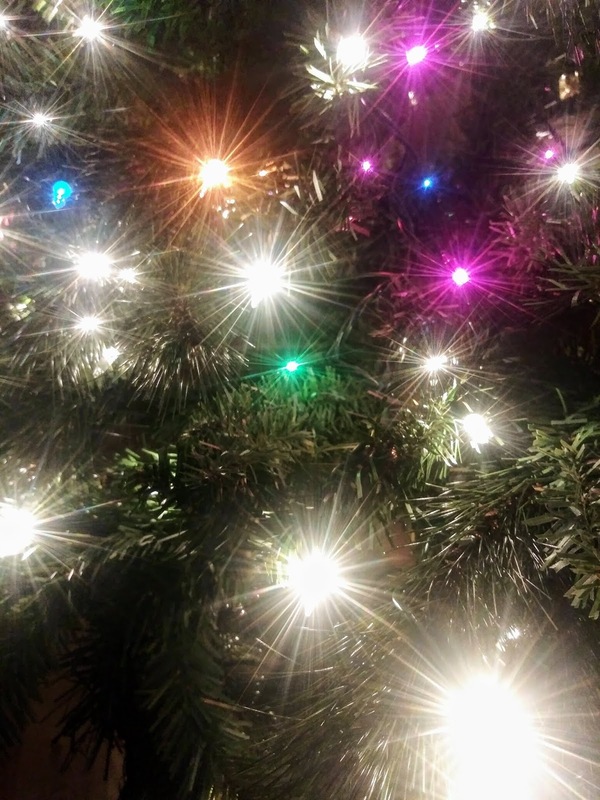 Do you prefer fake or real Christmas trees? 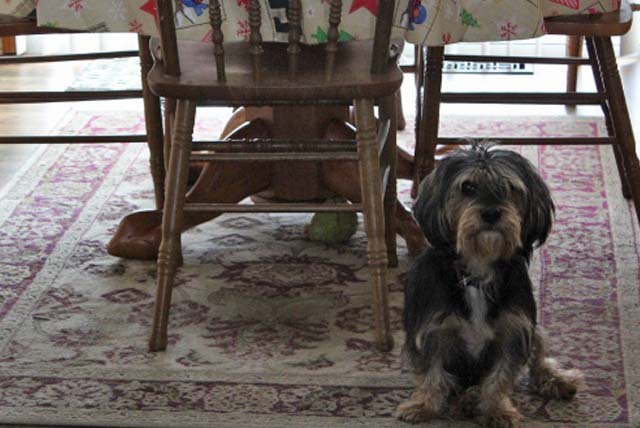 The other day I was going through folders of old Christmas pictures. 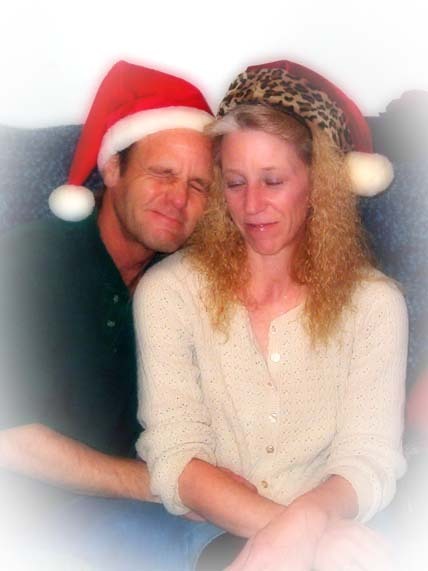 I'm not exactly sure what I was looking for but what I found was one of my favorite pictures of Wade and I at Christmas. This was in 2006. The quality of the picture isn't the greatest nor is the composition. It's just the silliness of his face and I'm not sure what was going on with me there. Maybe I had already had my second glass of wine, which by the way has always been my limit. I can't look at this picture without crying. I thought I would play with it a little. Ya know, just because my tear ducts needed cleaned out a little. Woke up early yesterday morning and while I was drinking my first cup of coffee I hoped that the phone would not ring. As much as I like the extra money in my paycheck, I didn't want to get called in to work. I was looking forward to a lazy day. No call to work so around 8:30 I called my doctors office about something I have been telling myself I should probably call about. They got me in later that same morning. I actually called about a couple things. One is hopefully just an infection that will be cleared up with an antibiotic the other she said we have to play the insurance game. In order for her to get the MRI that would detect whether or not I have a pinched nerve, the insurance requires an x-ray be done which is not capable of detecting a pinched nerve. After I left the doctors office I went to get the x-ray done. If I were only 30 years younger I would have had to do some flirting with the adorable x-ray technician. Hard to believe that Christmas is only one week away. Time sure does fly. I've had people asking me what my plans are. Are the kids coming over? Am I going anywhere? 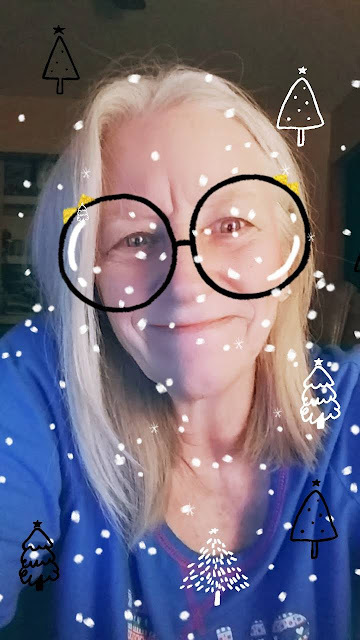 My answer is simply "I don't know" I have off Christmas eve and Christmas day and personally I think that 2 days of hibernating and sitting around in my pajamas sounds pretty darn good. I doubt it will work out that way though. 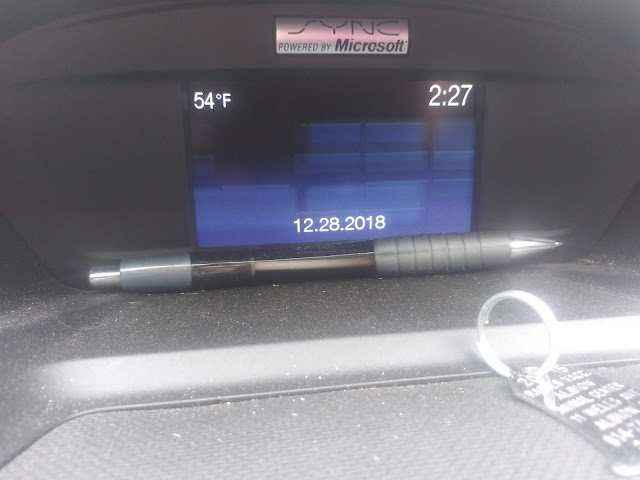 Every year I set out to post every single day for the entire year. I am only 14 posts away from reaching that goal. I think this is the year I'm finally going to make it. 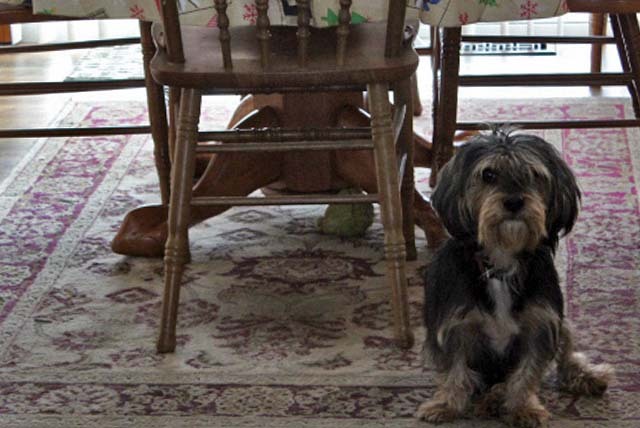 Now that you have listened to me ramble I will reward you with a Gibbs picture. 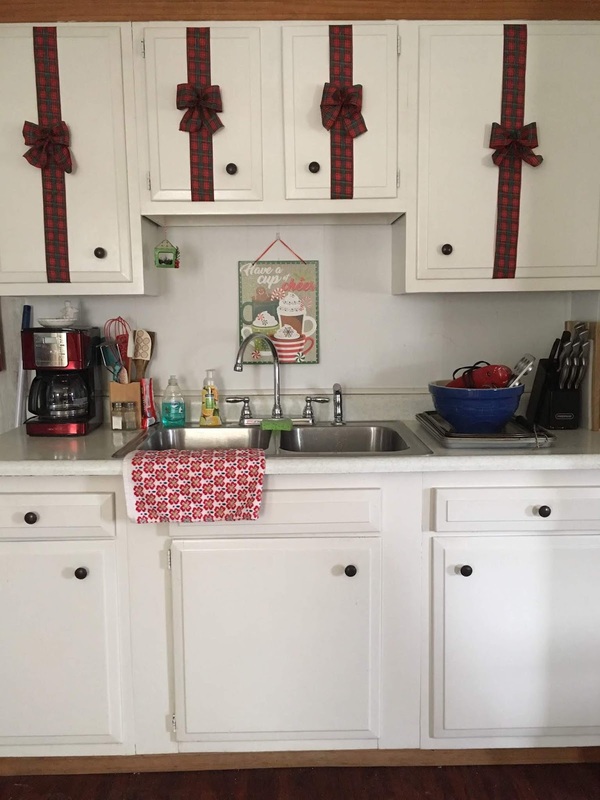 Since I am feeling lazy and totally uninspired, today I have a picture my daugther sent me of her kitchen. Don't you just love what a roll of Christmas ribbon from the dollar store can do. 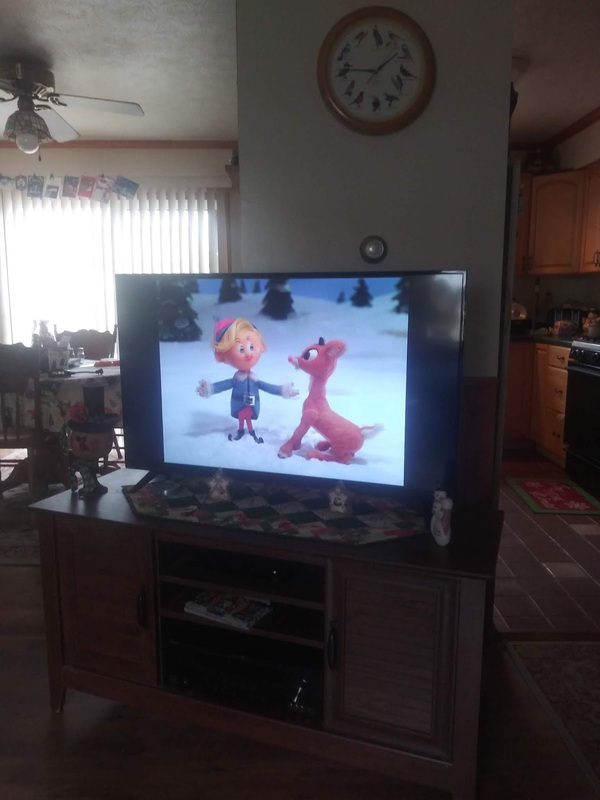 My daughter Amanda and I had a Christmas movie day yesterday. She came over with her dvd's and we watched Rudolph, Frosty, the Grinch and A Christmas story 2. Yesterday was a beautiful day. When I left work it was 43 degrees. That may sound cold to my southern friends but around these parts it felt pretty warm after the 20's and 30's we've had. The snow is gone now too. I decided it was the perfect opportunity to put out the lights that I have for outside. I'm a bit of a cheater. Instead of stringing lights I've got a couple spotlights. 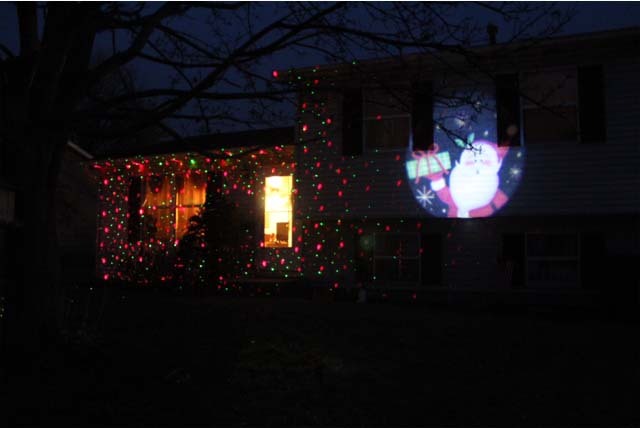 One shines red and green lights all over and the other is just a spotlight that projects a picture of Santa. I wish I could get the red and green to cover the whole house but with the tree in the middle of the yard it just won't do it. I could have bought another one but instead I went with the Santa. The first picture didn't turn out so well. It used the flash and you really can't get the whole effect. 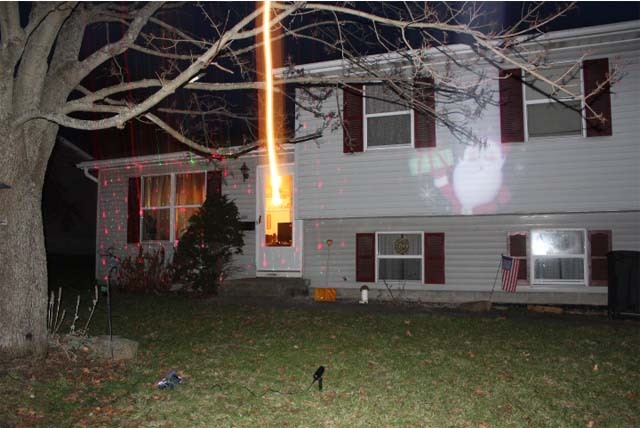 Pretty cool laser beam shooting up out of my front door though don't you think? The next one I tried without the flash. I might need to move the Santa in closer so he fits better between the two windows. Even though I don't get a whole weekend off I'm still very happy that today is Friday. The extra hours are nice and Monday and Tuesday I only went in for 1 1/2 each day but I still feel like it's been a long time since I've had a day off. My computer was moving slow and I clicked several times trying to get the upload window to pop open. The next thing I knew this picture had been uploaded. Long time readers will remember Duke. I don't remember how long ago this was taken but I'm pretty sure that Sandra from Mad Snapper did this picture. Everyone keeps asking me if I'm ready for Christmas. Well I guess I am but I'm more ready for Jan 2nd and the holidays to be over with. There really isn't all that much for me to do. I'm not buying gifts this year, the budget just won't allow it. I'm not doing any baking because I'll eat too much of it. No parties to go to and I'm not even sure who all will be coming over here. 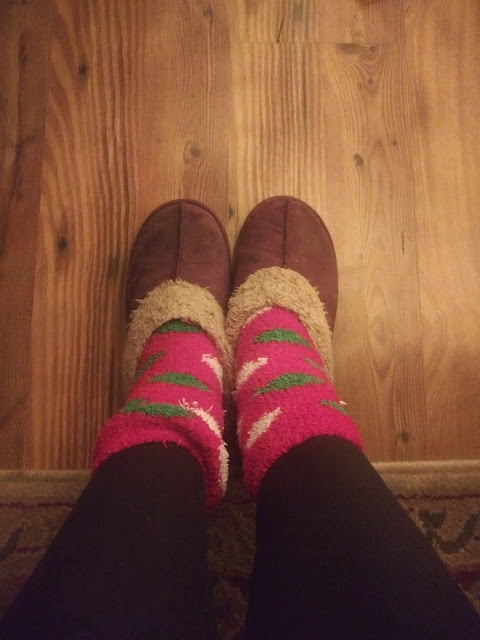 At least the decorations are up, which makes my daughter happy and I'm enjoying the lights from the Christmas tree in the evenings. 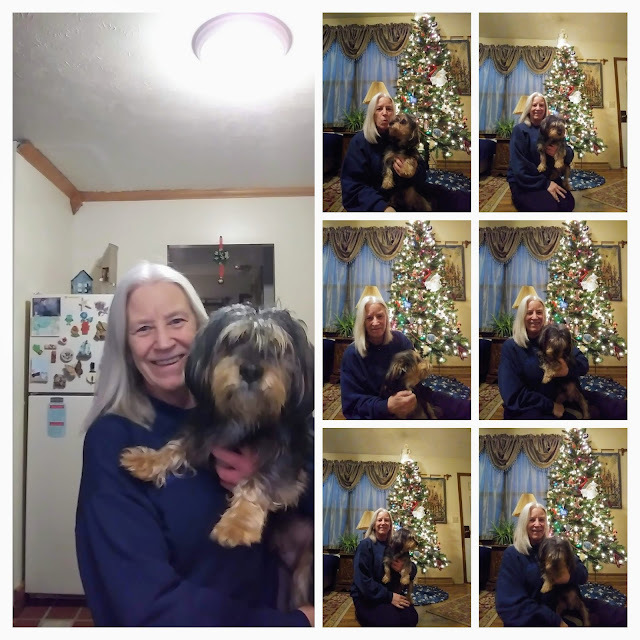 My friend Sandra from Mad Snapper posted about taking selfies by using your hand. I had no idea you could do that and she explained how. Of course I had to try it out. Gibbs did not enjoy this little session. He would look at the phone while I was holding my hand up but would look away once I put my hand down. I tried doing kissy noises to get him to look up and I got caught in the act. The whole time we were doing the pictures in front of the tree he was making a whining/growling noise. I decided it was probably best to stop. I had my follow up appointment yesterday with OVR. I'm not really sure why it was necessary because there really was no additional information they needed and there has been no change in my status. All she really did was go over what's been done so far and to tell me I have been approved for the hearing aides that were talked about at my last ENT appointment. 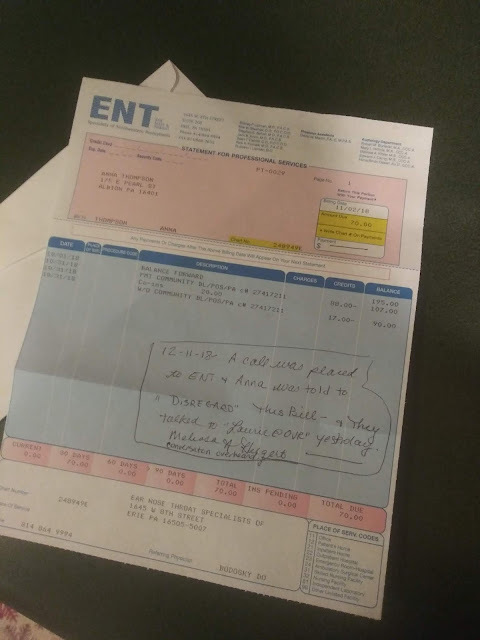 It was worth going though because I had gotten a bill in the mail after my last ENT appointment. The bill was for $70 and I hadn't paid it yet because I wanted to ask the case worker about it first. I thought maybe I misunderstood something and I owed that money. When I showed her the bill she got a disgusted look on her face and she said "DON"T PAY IT'. She told me they have already been paid and they should not have been billing me for anything. While I was there she put her phone on speaker and had me call ENT to inquire about the bill. After being put on hold for a while I was told the bill was an error and I should disregard it. The case worker made a note on my bill saying what she heard them tell me. The other positive thing that happened was she asked me about other health issues I have and if there was anything they could do to assist with them. Then she asked if I wore glasses. I explained that I have them but don't wear them and it's been a long time since I've had my eyes checked. Now she's also going to put in a request for an exam and new glasses for me. After I got back from work yesterday morning I did a little of this and a little of that. I worked on cleaning up my craft room but I still have a long way to go on that. I also worked on one of those shutters that I showed you before. I did a repair job to a broken Christmas decoration and I also did a load of laundry. All that and it really feels like I did very little. 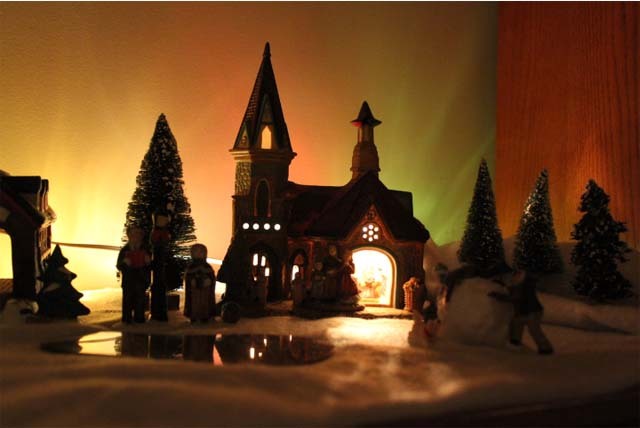 I thought I would do a quick video and show you the whole village on my fireplace. It's not very big so I went up and back. Pardon the jerky movements, it was filmed by jerky me. According to the schedule at work I have today and tomorrow off. The schedule would be wrong. I agreed to go in for a couple hours on both days to cover for the missing cashier until the office person gets in. Tomorrow after I leave work I have an appointment with OVR. I have no idea what it's for other than a follow up before they can continue with my hearing aid thing. When I got home from work yesterday, I destroyed my craft room more than it already was by working on one little card. Nope, don't have a picture of it. I then paid the phone bill that I almost forgot about and took care of a couple other bills while I was at it. Those tasks along with making myself dinner and cleaning up the kitchen pretty much took up the remainder of the day. 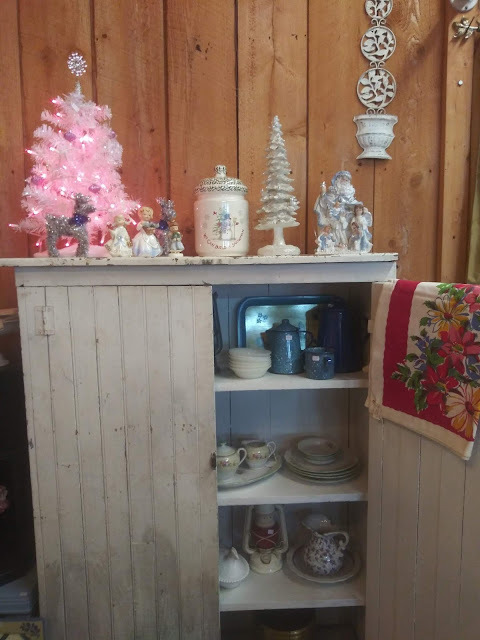 This was a last minute post so I grabbed a couple pictures from the village that's set up on the top of my fake fireplace. 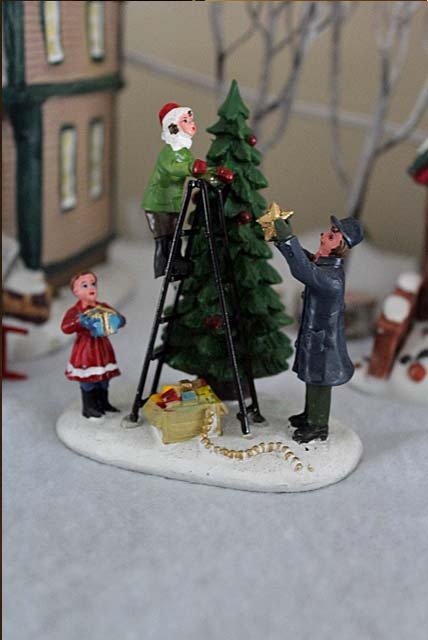 The whole town is working on decorating. Not a great picture but I liked the color on the wall from the lights. I hear about events and think they sound like a lot of fun. I've already told you about the reindeer trail walk that Amanda and I went to last weekend. 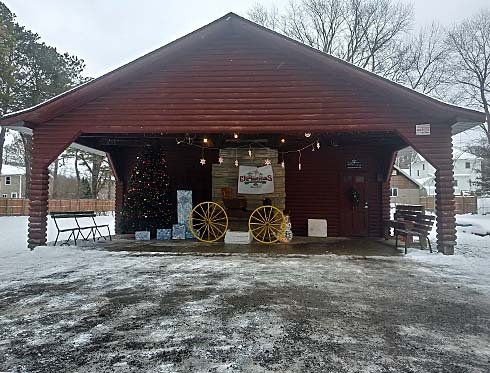 This weekend there was a Christmas in the park event right here in my little town. It was being held at the park just down the street from me. and several others that I can't remember. I bundled up and took a ride down the street. I saw the crafts, all 5 tables. 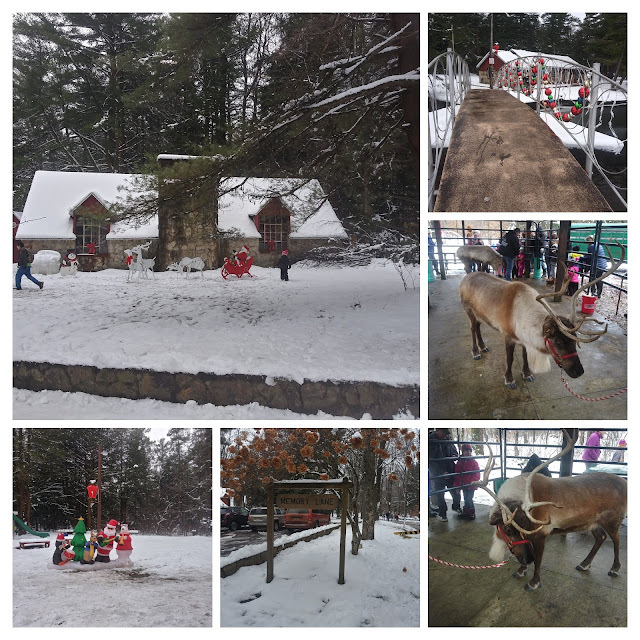 There were no carolers or live nativity. I didn't look in the one building because that was where they were supposed to be doing the story time. I passed by the food, took a brisk walk around the park and then headed back home. 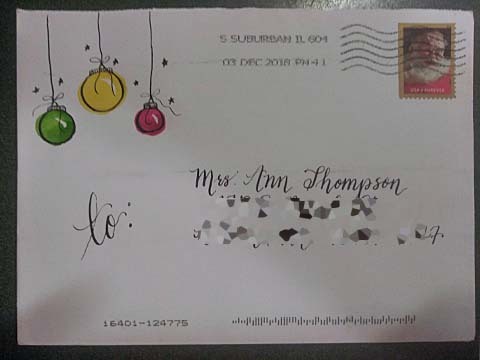 I got a Christmas card in the mail the other day and while the card itself was wonderful the envelope was simply amazing. 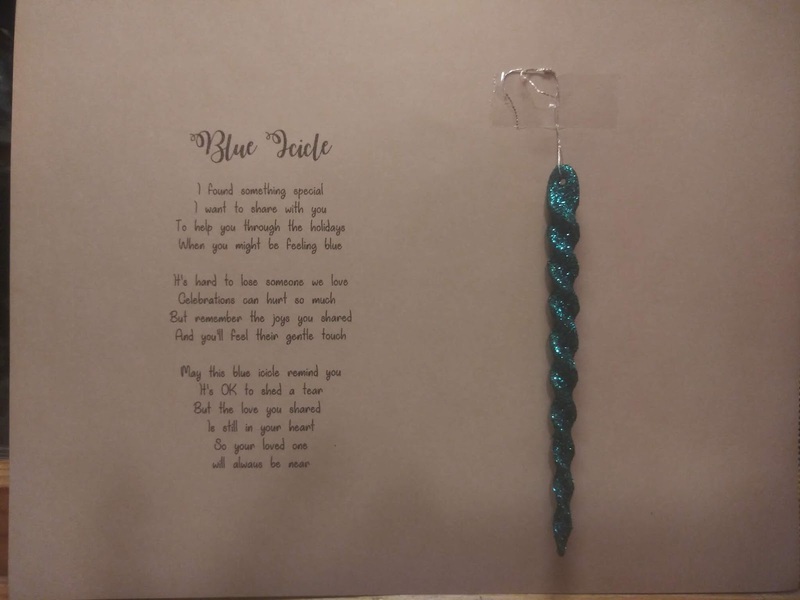 Longtime blog pal Lin from Duke and wheel is learning caligraphy and this is the most amazing envelope ever. She even did the little Christmas ornaments in watercolors. Love the look of of the caligraphy. Awesome job Lin. 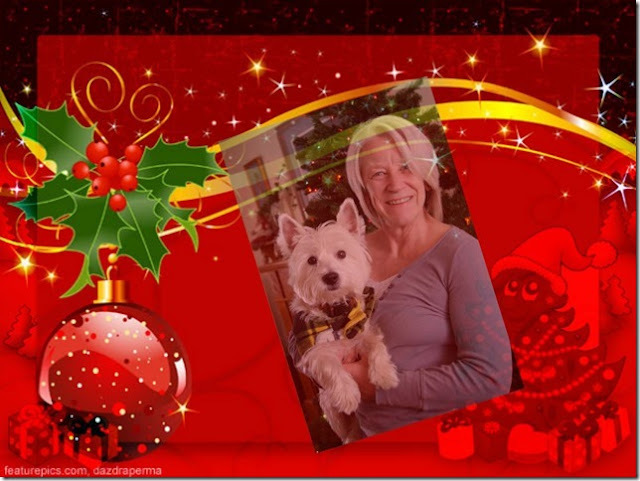 Before the holiday season starts getting crazy busy for some of you, Gibbs and I would like to send you all a message. Today I've got Amanda's pictures from the antique shop. There were tons of cookie cutters and a very cool rolling pin. I thought these were really pretty and I was tempted to buy one. They were $4 each. 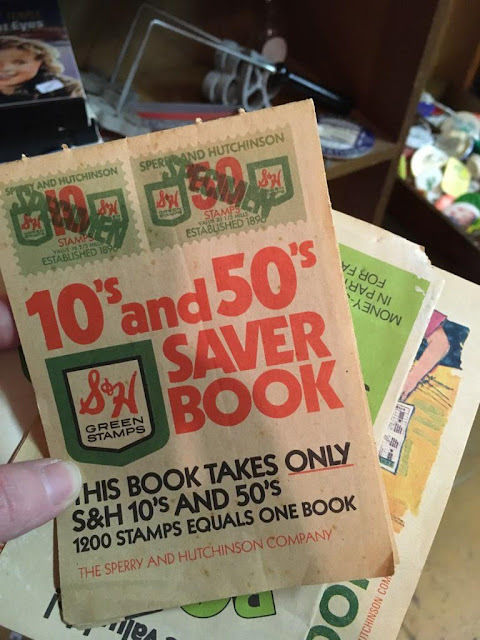 I had to explain to my daughter what S&H green stamps were. What a blast from the past. I remember putting all those stamps in the books. I can't remember what we ever got with them. I got called in to work again yesterday. Even though it kind of messed up my day off I only worked for 4 hours. The only plans I had were to get the mess from decorating cleaned up and make sure the mortgage payment wad made. I accomplished both once I got home. 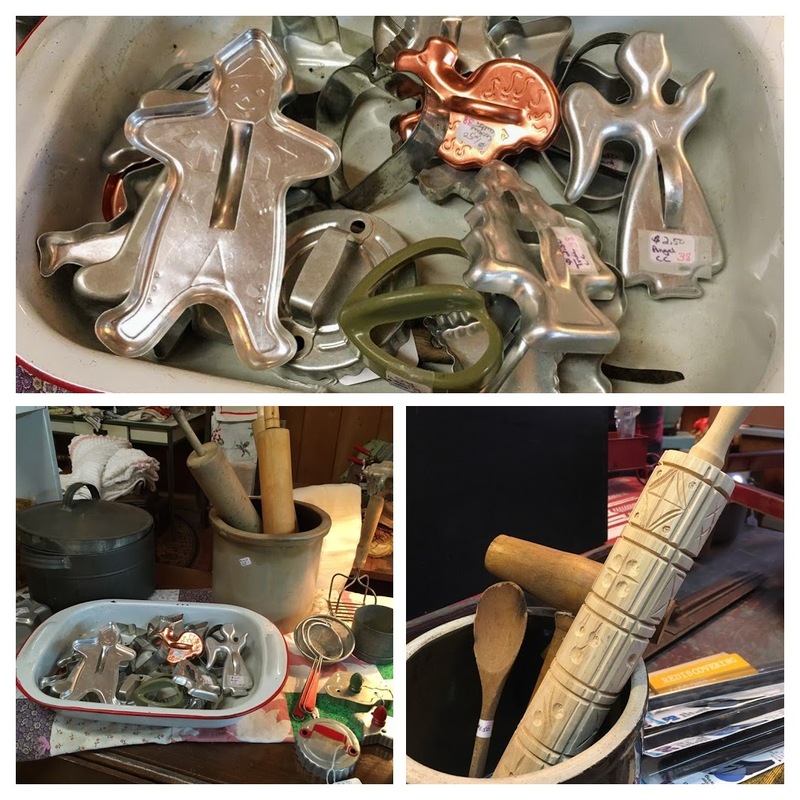 Over the years when Wade and I would go to his dads house, we would pass by an antique store that I always wanted to stop at. Of course we were usually on a time schedule and couldn't stop and on the way home they were always closed. Wade was probably secretly very happy because he hated things like that. 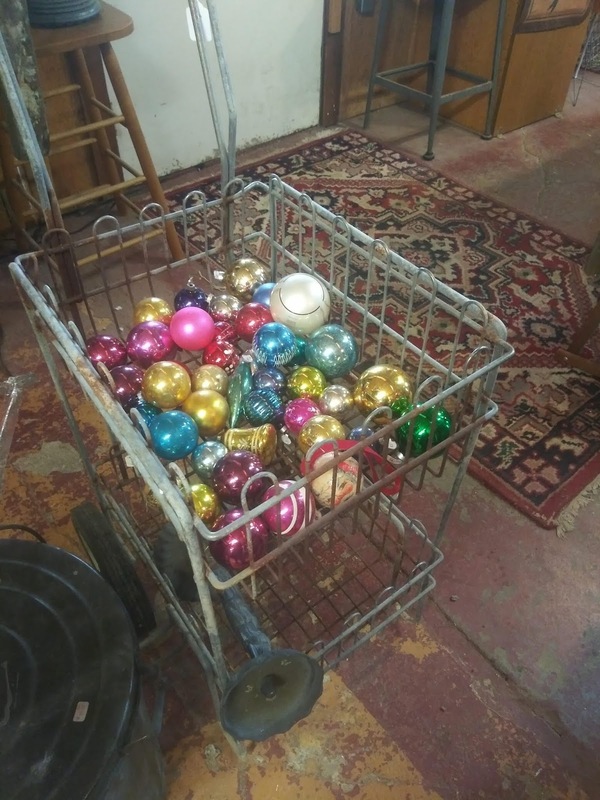 This cart full of old Christmas ornaments caught my eye. I saw a couple things that I would have liked to have bought but I behaved myself and only browsed. 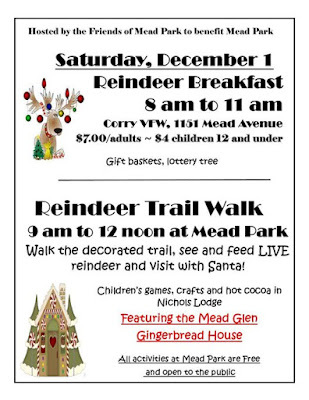 I saw the Reindeer Trail Walk advertised on Facebook and asked if anyone wanted to go with me. It's about an hour drive from my house but I thought it might be kind of fun. It turned out that it was just me and my daughter Amanda that went. Let me just say that it was not what I was expecting. It was set u in a park and they did have it decorated but I thought that maybe they would have reindeer throughout the park. We walked a fair distance and saw 2 reindeer that were in a fenced area You could walk right and get a good look at them and there were handlers there to talk about them but that was it. With freezing noses we trudged back to the heat of the car and drove back home. 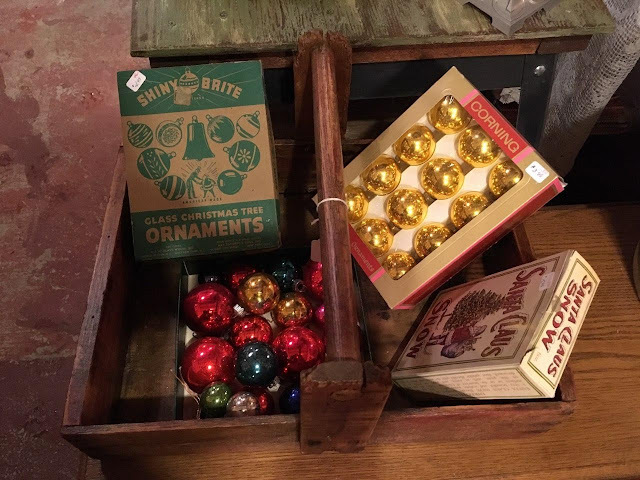 A stop was made at an antique store which I'll post pictures of tomorrow. 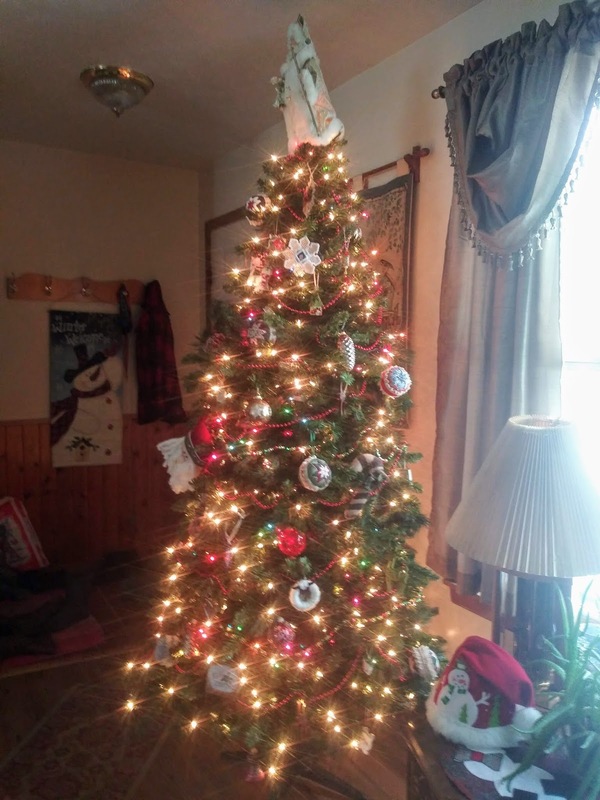 After getting back to my house Amanda decorated my tree and I worked on putting out some of the other decorations. Now the house is a cluttered mess with boxes and totes all over the place. Today after work I'll have to try and get things straightened up and looking presentable. Then again, I'm the only one who will see it so if it doesn't bother me it may wait until Monday. I managed to cross laundry off the list although it's still sitting in the dryer. 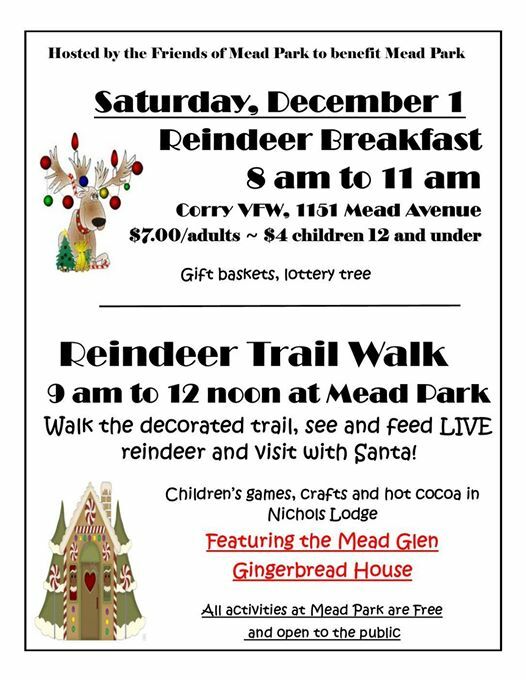 Have plans today to go to a reindeer walk. Should be fun and hopefully I'll get lots of pictures.Doesn't look like much will get accomplished around the house today either.